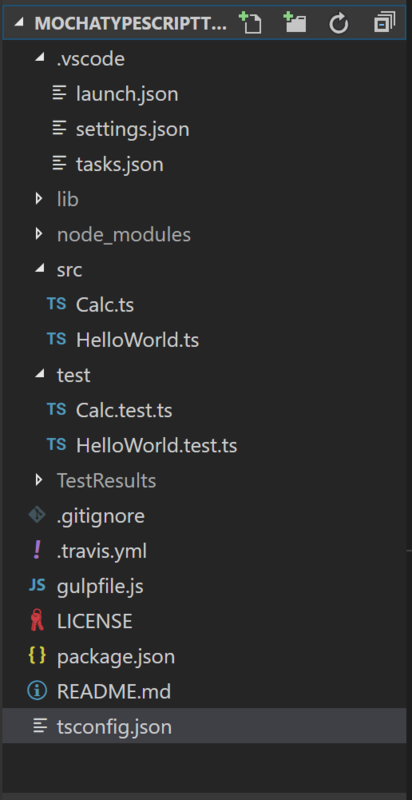 If you are looking for setting up node project with TypeScript, Gulp and Mocha, first refer previous post and then continue below for configuring VSTS CI build for Node.js app with Gulp and Mocha tests. In below post, we’ll import existing project from Github to VSTS and then configure VSTS CI build using web only steps. If you are already using VSTS for your team project, directly start from step 3 below. VSTS account: create one for free or use existing one. Make sure you have administrator access for the team project on which you are configuring CI build. Start with creating new Project. 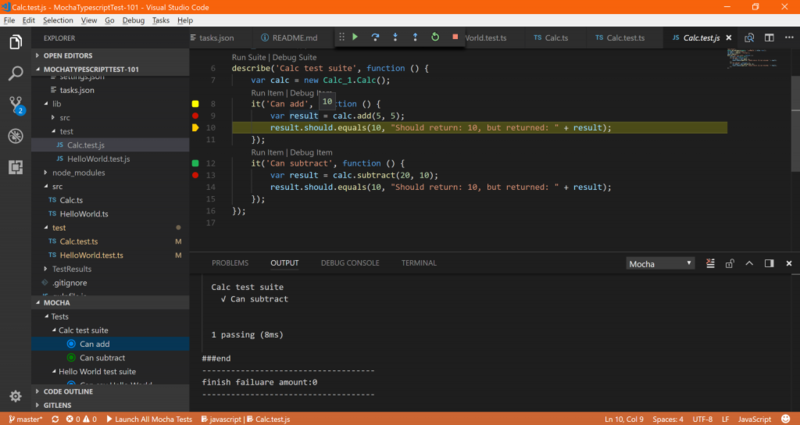 Now go to Code tab, see all project code is now imported to our newly created VSTS team project. I have already created one, hence you can see one definition already exist in below screen. If you are creating for the first time, there won’t be any build definition present. Upon clicking +New on the page, you can either choose to start with an empty process or select an template. VSTS gives us varieties of templates. 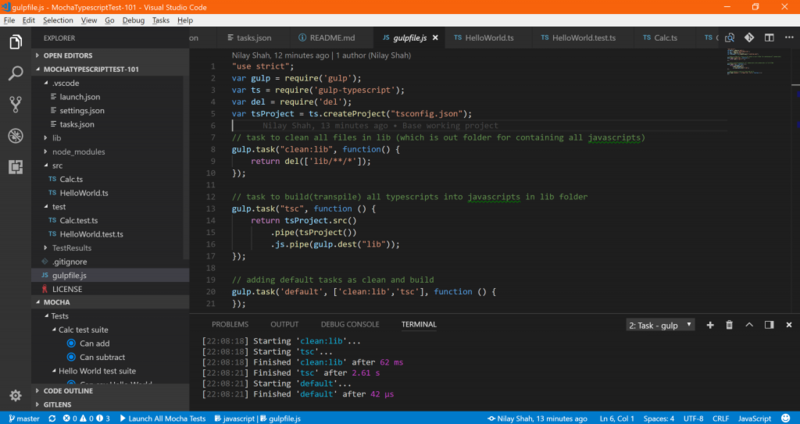 For node application, VSTS gives two templates: NodeJS with Grunt and NodeJS with Gulp. Let’s select NodeJS with Gulp. Since we have already imported project from Github to VSTS, we’ll choose This project. And also choose repository and branch for which we are configuring CI. Now that we have selected which resources to be built (project, repo, branch etc), we’ll have to configure steps for build the project. We can have multiple phases in build and each phases can have multiple tasks. For simplicity let’s have single Phase i.e. Phase 1 which will have all the tasks to get the build and tests run. Since we have used VSTS template NodeJS with Gulp, we can see npm install and Gulp are already added under Phase 1. Remaining tasks can be added simply by + icon next to Phase 1. Second step in build would be gulp task configuration. 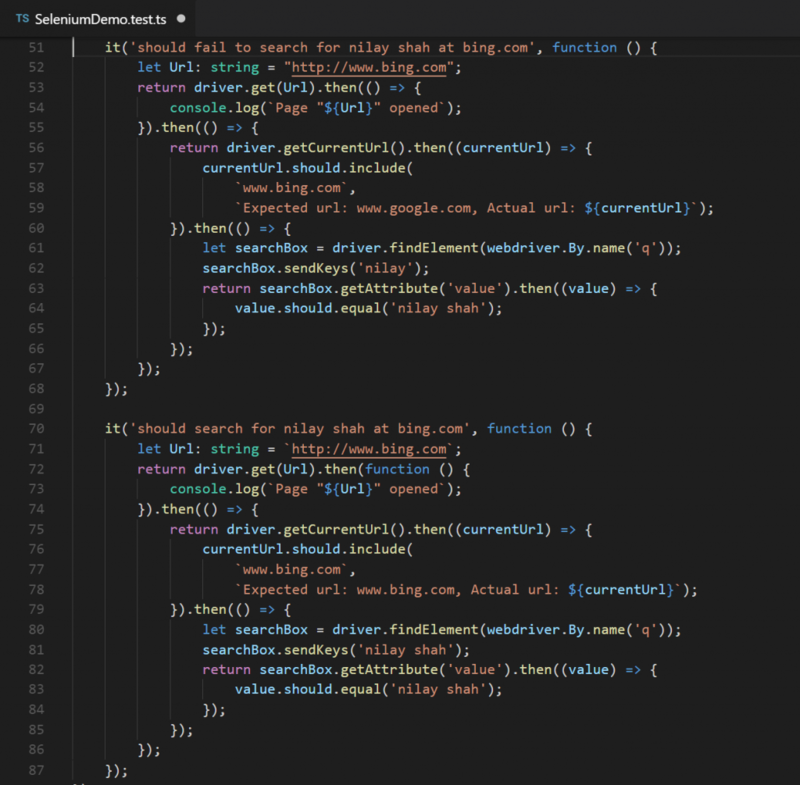 Pick path to gulpfile.js and mention the task name to be run as part of build. Leave blank in task name if you want to run gulp default task. Below will run all mocha tests under lib/test/ directory and test report will be saved in file: ./TestResults/TEST-RESULT.xml in junit report format. "test": "mocha lib/test/**/*.js --reporter mocha-junit-reporter --reporter-options     mochaFile=./TestResults/TEST-RESULT.xml"
Configure Publish Mocha Test Results task as shown below, and save the build definition. Click on Queue new build after saving build definition. 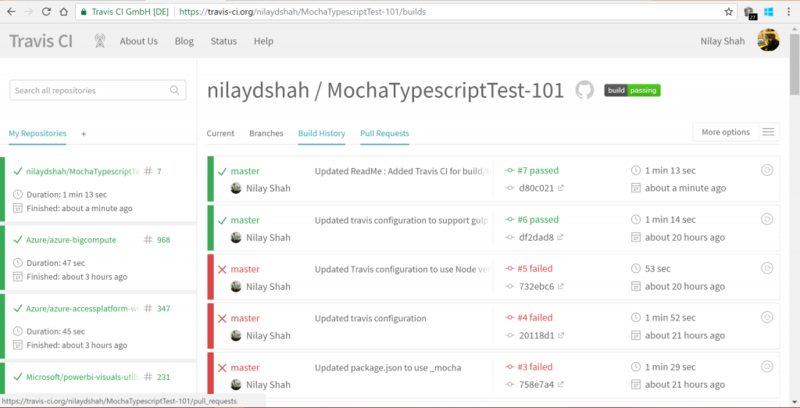 This post covered VSTS CI configuration for Node.js app with Gulp and Mocha. Refer Microsoft’s documentation at link for this topic. 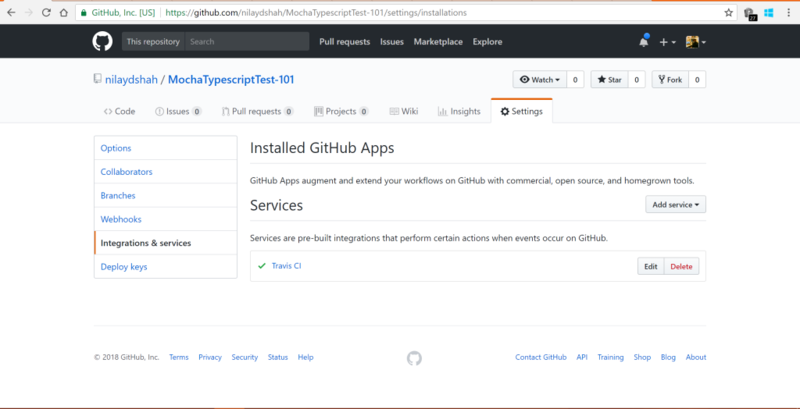 VSTS can also be used as Continuous Delivery or Continuous Deployment which is not covered in this post. Refer this link for Continuous Deployment (CD) using Release Definitions. 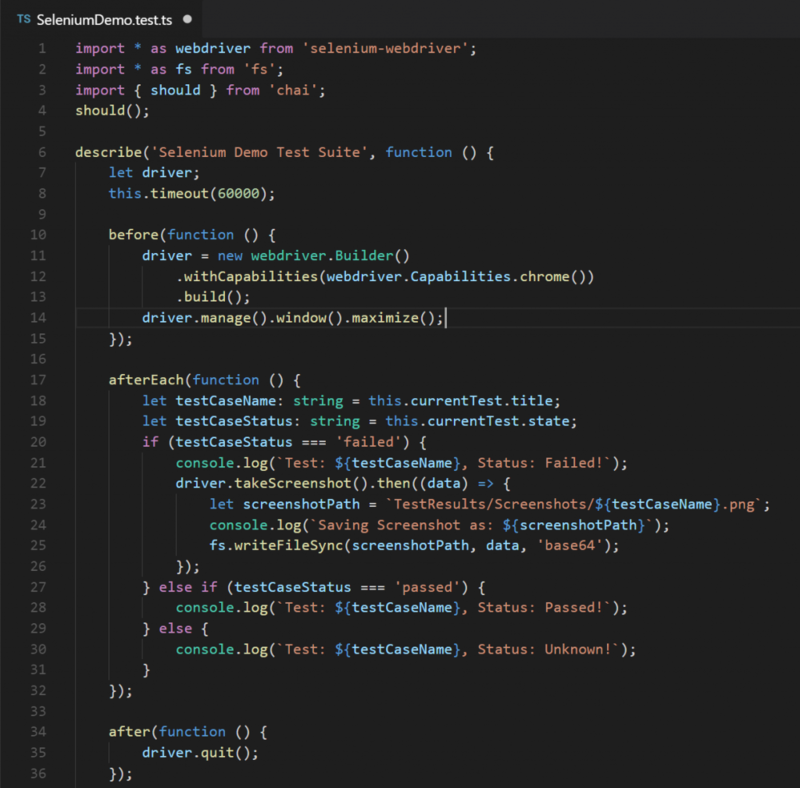 In this post, we’ll see how to do UI test automation in node application using TypeScript, Mocha and Selenium. 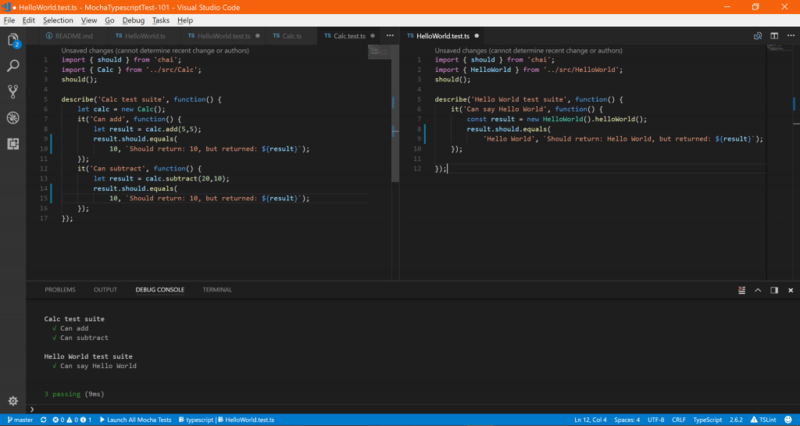 This post is extension of my previous post, where I’ve covered Setting up node application with TypeScript in VS Code — using mocha, chai, mochawesome, gulp, travis If you are looking for setting up node project with TypeScript and Mocha, first refer previous post and then continue below for browser based tests with selenium. Download Chromedriver and put that in PATH. Note that, I’ve kept chromedriver in project root folder, and I’ve added PATH as . (current directory) so test will be able to find chromedriver from the PATH. 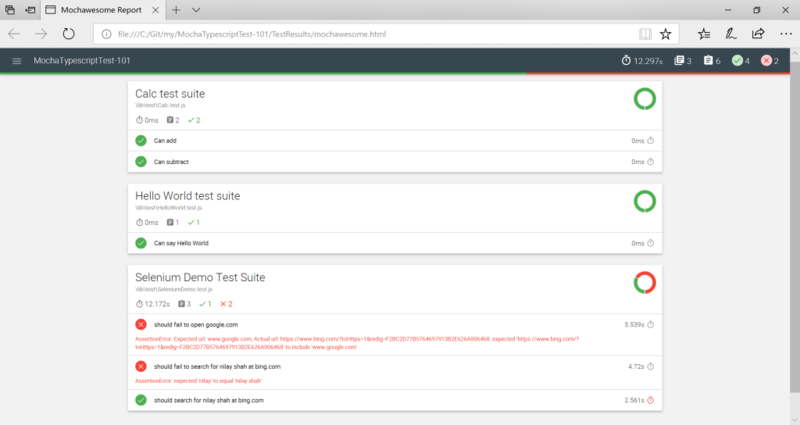 Test will launch single chrome browser instance, perform all tests in sequence and then close browser. 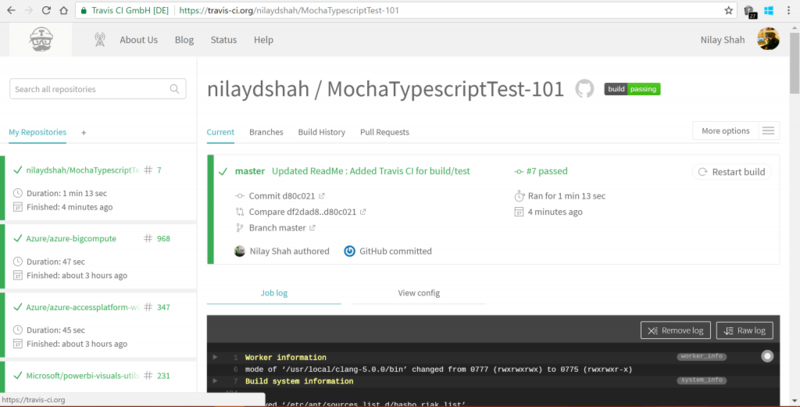 This post covers basic steps for setting up UI test automation using Node.js, TypeScript and Mocha. If you will go through the code at github.com, you will notice that I’ve skipped this test with describe.skip() — this is because repo is configured with Travis CI which builds and runs all tests. 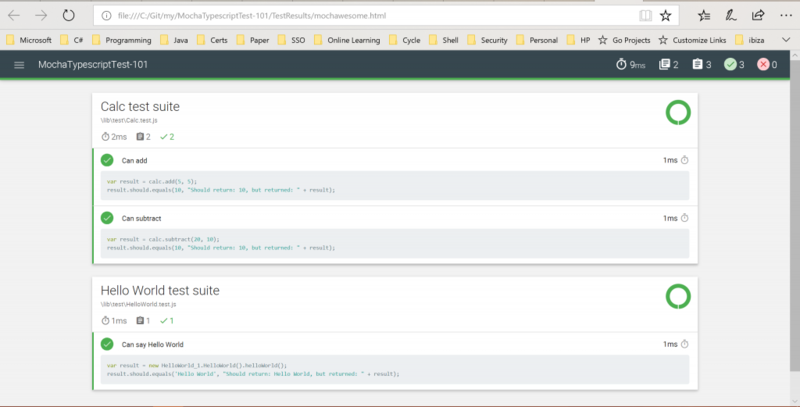 And to get UI tests running in CI requires headless chromedriver.